Sterling Silver Cat Eye Necklace 5 Different colored cat eye beads are the main attraction on this chain marked 925. 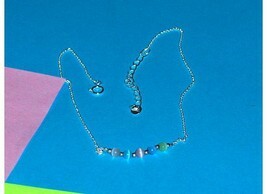 Adjustable to place at 12 to 14 inches in length. C-ring clasp on small 1 mm rolo chain. The cat eye beads are about 4 mm in size.